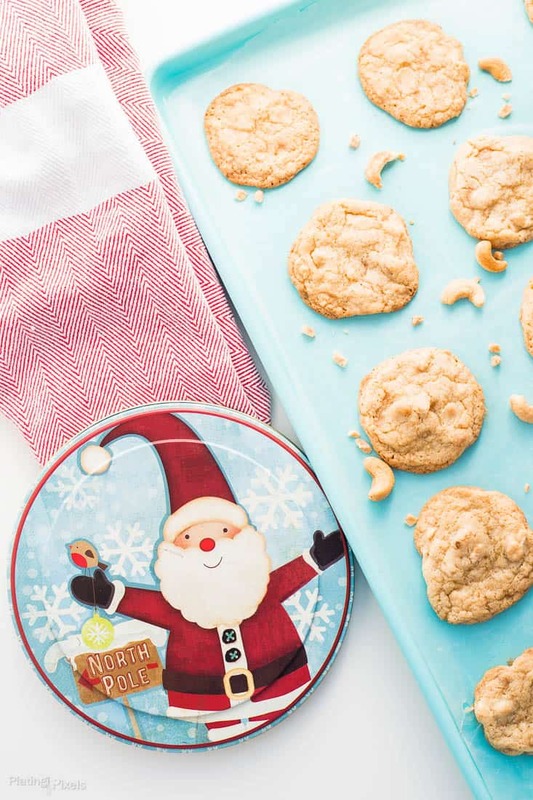 Chewy Cashew Toffee Cookies are an easy Christmas or holiday cookie. 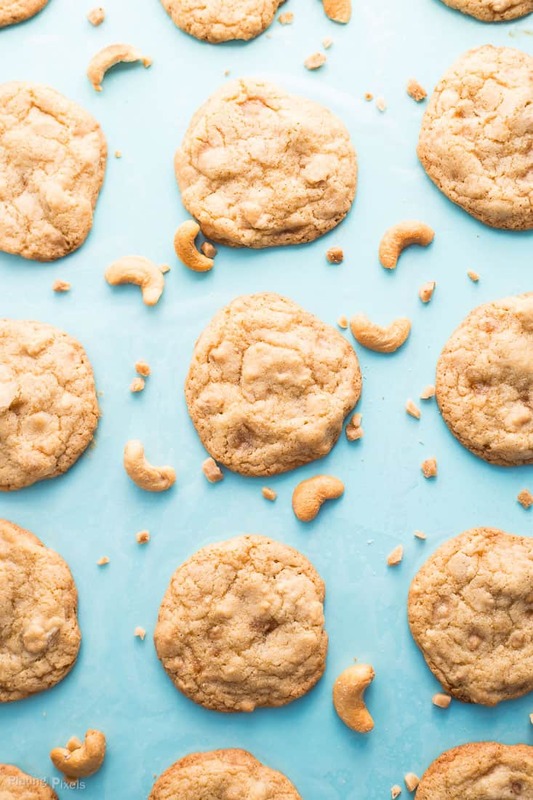 Crisp, moist and chewy toffee cookies with roasted cashews and toffee bits baked in. 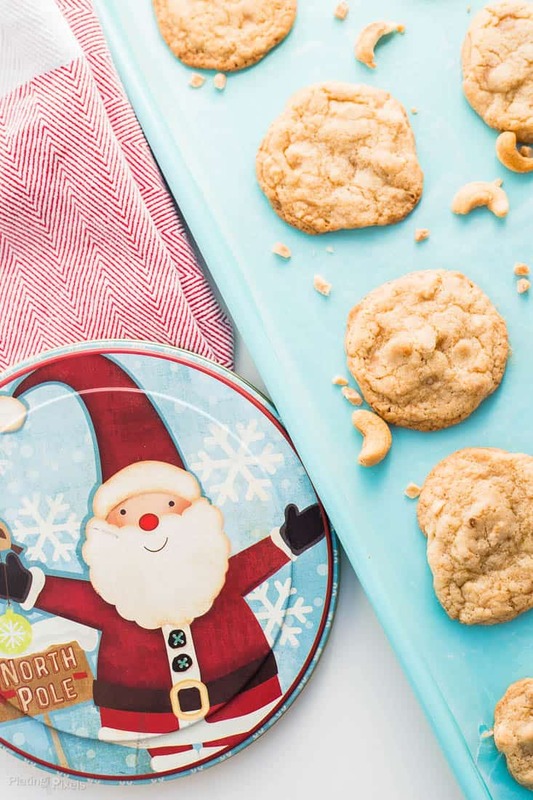 Within this post, you’ll make fun holiday cookies with wonderful flavor and texture. Plus you’ll learn about the differences between baking soda and baking powder, and why some recipes call for either, both or none. It’s that time of year again…time to swap cookies! I’m sure you’ve had plenty of holiday treats lately, and hopefully been sharing with others. I shared these cashew toffee cookies as part of The Great Food Blogger Cookie Swap. Sounds fun right? It totally is, what’s not to love about sending fellow food bloggers homemade cookies, and of course getting cookies in return. It’s not only for fun either. Every blogger donated to be a part of this, with the proceeds going to Cookies for Kids with Cancer. Warm fuzzy feelings plus yummy cookies is what this all about. 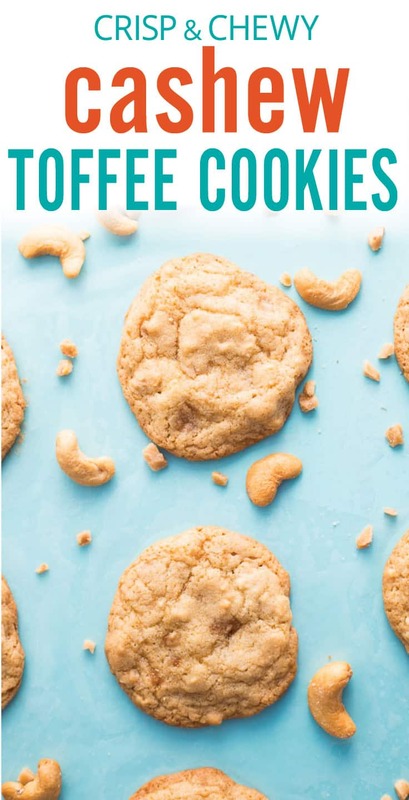 These Chewy Cashew Toffee Cookies are a recipe I adapted from a cookbook magazine. I’ve made it my own with toffee bits being the highlight of the recipe. These cookies are absolutely divine—small, flat cookies that are crisp on the edges, but super chewy throughout. The chopped roasted cashews and toffee baking bits bring subtle crunch and texture that is a true symphony to the senses. 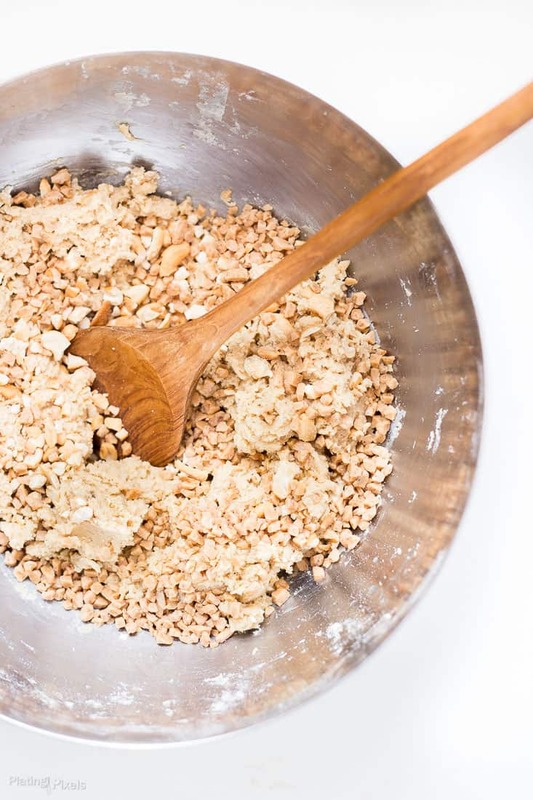 I love the creaminess of the cashews but you could also use hazelnuts that will give a delicious nutty flavor and will work really well. These cookies made a great snack, sweet treat and even make fun gifts during the festive season. Put them in cellophane bags or a box and tie with a festive ribbon. Also if you love Christmas cookies then check out my Ultimate Guide to Decorated Christmas Cookies (40+ recipes with tips) it has all you could ever need when it comes to festive cookies! Brown sugar with extra moisture is the key ingredient to make cookies chewy. The amount of eggs and ratio of other ingredients also affects chewiness. What also makes these cookies extra special is the added toffee bits. They add the most delicious caramel flavor and a little surprise in every bite. If you find the cookies dough too sticky to spoon onto a baking sheet, place in the fridge to firm up for 5-10 minutes. Use a heaped teaspoon to measure the cookies. They spread out during baking and shouldn’t be too large. Using an ice cream scoop, for example, would be too large. Line baking sheet with parchment paper to prevent the cookies from sticking. Cool cookies on the baking sheet a bit, then transfer to cooling rack. You can store the cookies in cookie tins or airtight containers for up to 1 week (possibly longer) or freeze them for later. Baking soda has only one ingredient–sodium bicarbonate. It’s a base that reacts when it comes into contact with acids like buttermilk or vinegar. The reaction happens almost instantly to create carbon dioxide (CO2); which bubbles up and leavens bread and baked goods; basically making dough or batter rise. Baking powder fixes this by delaying the reaction and is double acting It contains sodium acid pyrophosphate or sodium aluminum sulfate, which won’t react with the sodium bicarbonate until the batter is moist (mixed with wet ingredients) and heated (baked in the oven). These two reactions create the leavening effect; giving you plenty of time to prep your dough. Learn more details in this NC State University food science article. Flavor profiles: Rich and sweet toffee (roasted sugar) mixed with buttery cashews. Texture: Crisp edges and chewy throughout, a bit of crunch as well. Toffee cookies with roasted cashews and toffee bits baked right in. Preheat oven to 375º F. In a large mixing bowl, beat butter with electric mixer on medium speed about 30 seconds. Beat in sugar, brown sugar, baking powder, baking soda and salt until combined. Beat in eggs and vanilla until combined, scraping sides of bowl as necessary. Slowly beat in flour; if too thick mix final parts with a wooden spoon. Stir in cashew and toffee pieces. Drop dough onto large parchment lined baking sheet roughly 2-inches apart. Use a heaping teaspoon as a measurement. They'll spread out, but cookies shouldn't be too large. Bake 8–10 minutes until edges are slightly browned. Cool on baking sheet slightly then transfer cookies to a cooling rack. Bake in multiple batches if needed. If you find the cookies dough to sticky to spoon onto a baking sheet then place it in the fridge to firm up for 5-10 minutes. Use a heaped teaspoon to measure out the cookies. They spread out whilst baking and shouldn't be too large. Using an ice cream scoop for example would be too large. Make sure to line your baking tray to stop the cookies from sticking. Cool on the baking sheet then on a cooling rack after baking. You can store the cookies in cookie tins or other suitable containers for up to 1 week (possibly longer) or freeze them for later. Recipe adapted from Better Homes & Gardens: Christmas Cookies. Print. 2014. These cookies, guys. I have no words. Cashew and toffee sounds freakin’ amazing! I’m drooling right now. They are totally freakin amazing! Thanks and I appreciate your excitement Christie! I bet these cookies are so good. 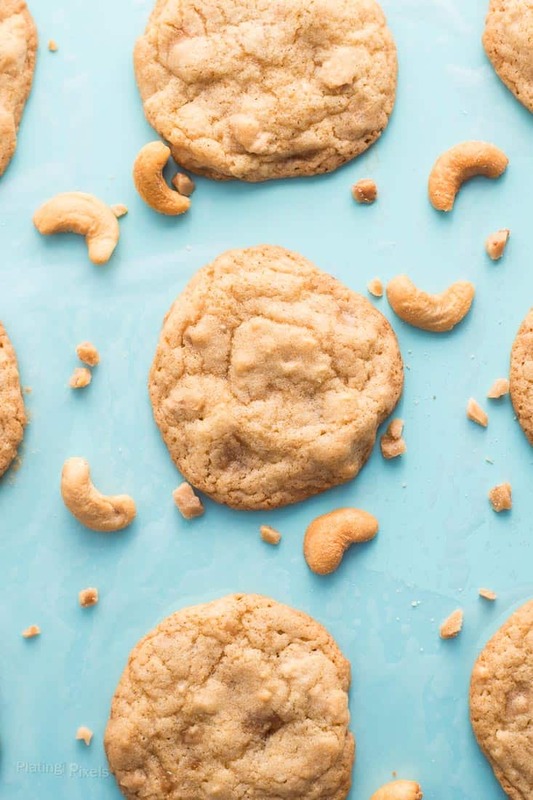 I love cashews, but I’ve never had them in a cookie before! Thanks! This was my first time with cashew cookies but sure won’t be the last! Crisp and chewy? Cashews and toffee? Good grief! These sound perfect! Would love to dunk a few into some milk! Wonderful combos right?! I haven’t dunked cookies in milk in so long. Thanks for the reminder Patricia! I would definitely make these. I love cashews. Cashews are awesome in almost anything. Thanks Jasmine! Yum! My fiance would die over these! Haha that’s about the best response you can get. Thanks Sarah! Thanks so much Lindsay! I appreciate the feedback on my photos. The toffee is amazing and I’m sure you’ll love these! These cookies sound so yummy! Great flavor combo! They totally are. Thanks Leah!